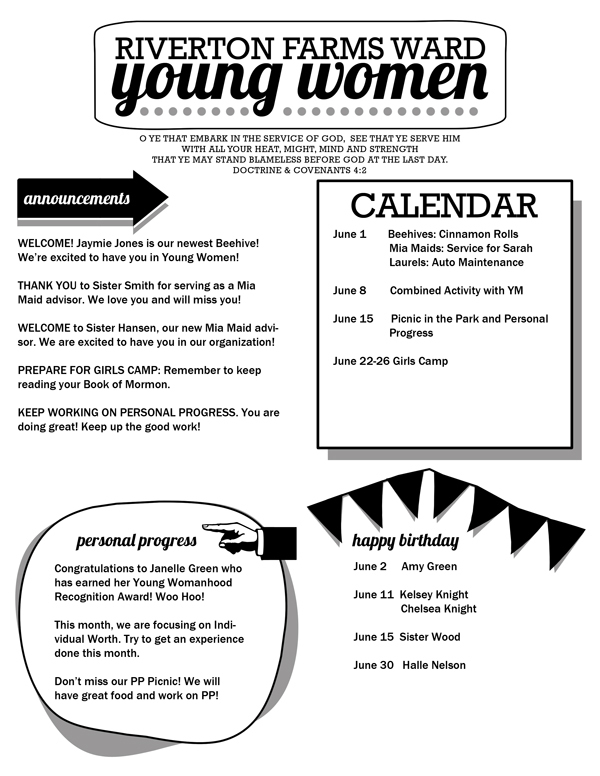 Here’s another much-requested printable for you: my Young Women’s Newsletter Template! And, I’ve updated it so that you can use it any year! My previous versions included the Mutual Theme in the header. Now, so that you can use the template year after year, I’ve added an editable field for the Mutual Theme. 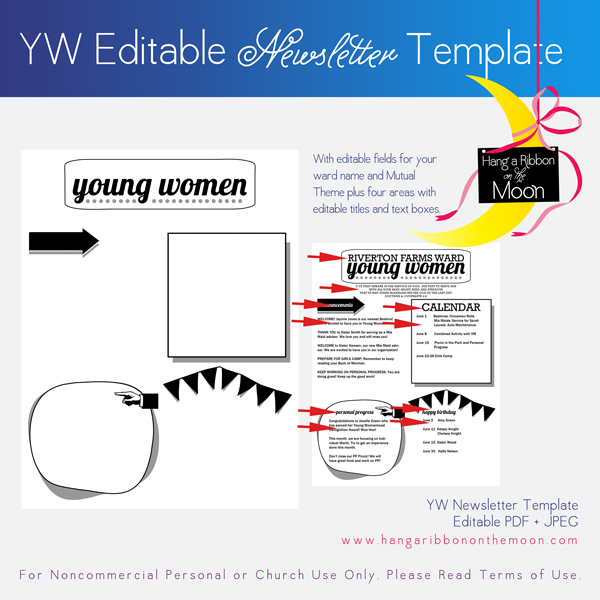 With this YW Newsletter Template PDF, you can build a newsletter or announcement sheet for your girls in just minutes. I’ve done all the designing, all you need to do is enter your ward/stake name, Mutual Theme (or other theme/scripture) and fill in the text titles and text. My newsletter template features a fun retro feel and provides you with a place to enter your ward/stake name, Mutual Theme and four areas to customize, each one with a title space and area for entering your own text. In the download (link at the end of this post), I’ve included an editable PDF file of the the template–simply add your info in Adobe Reader–PLUS a high-quality JPEG file, which you can customize in Word, Photoshop, Photoshop Elements or other software. You can download Adobe Reader for free here. Download my template file (link at the end of this post). Navigate to the unzipped newsletter file on your computer. Click Open. Enter your text. NOTE: If you want to indent something in the text, DO NOT use the TAB key. Instead, use the SPACE BAR. Save and print page 2 of the file. Download my YW Newsletter Template Here. Remember, all of my files are for noncommercial personal or Church use only. Please DO NOT SHARE MY FILES in any way! I really love this newsletter format! I used it in 2014 too. I print it and give it to the YW, then email to the YW and parents so they will be sure to see it as well. Would you send me a pdf without the instruction page attached? Thank You! I’m having a hard time editing after I’ve downloaded the template. Can you please send me the pdf to my email please!? I love using this template monthly for my young women and their mothers. Have you unzipped the download first? Do you have the most recent version of Adobe Reader? These two things can cause issues with editing PDF files. Downloaded the most recent Adobe, seems to be working now. Thank you!! This is EXACTLY what I was looking for–no, actually, this is much better than I could have imagined. Thank you SO much!! You are awesome! I love the template and it is a great help in my new calling. Thank you so much for sharing your talents. I can wait to try it! Thank you for this template! I know it is 2018 but it is still so helpful! Would you mind sending me the template without the instructions? thank you!